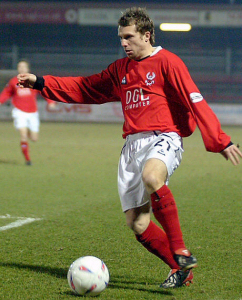 Jeff Kenna came back to the Harriers today to finalise the deal that takes the Harriers legend, Ian Foster, to Galway as his right-hand man come Physio. The news came as a shock to most Harriers fans and it now gives meaning to the rumours of a new Physio coming in soon. The problem is that this new Physio, Greg Pearson, is only in his early twenties and is also banging in goals galore for his present club Bishops Stortford. If true then it beggars belief how he will be able to do both jobs. As for Fozzie it needs no saying about how long he has been held in high regard by the majority of Harriers fans for both his playing abilities and in his later role of Physio. He took the job on, after retiring from the playing side three years ago due to a bad knee injury, when the previous holder of the post, Jimmy Conway, was sacked for mis-appropriating funds. Ian said this to the Official Website after the announcement; "It was a difficult decision to make, and I'd like to thank the manager, the players, the Chairman and the board for all of their support over the past two seasons". Fozzie will be unveiled to the Galway fans at a fans forum tonight when the Galway fans will be given a chance to meet their manager face to face for the first time.